Exeter College Music Academy Big Band in Concert!!! 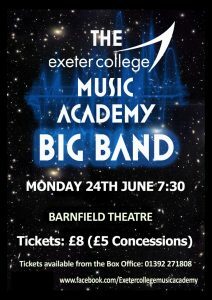 The Exeter College Big Band returns to the Barnfield Theatre for another explosive session of youthful exuberance!!! We will be performing a wide range of music from well-established big band charts to soul and popular music. Come along to hear our wonderful soloists and singers! The band is full of some of the best young musicians in Devon. We are delighted to be performing at the Barnfield Theatre once more and know that you’ll leave the show with a smile on your face! !